At last I am dressed properly, and I mean by that, I have a logo for the trip. I am very very grateful to both Alex Ashworth of Manifest for his inspiring and completely pertinent design, and to Mark Watkinson for the great illustration of some chap on a rather unique motorcycle. I have known them both for over 25 years and their support and kindness helping me to brand the trip is hugely appreciated. Alex is a dear and rock solid friend, who has also helped the agency gets to the top of the game with extraordinary communications, be it the website, the newsletters, our logo, or our printed material. Mark was the first illustrator who joined me at the agency in 1985. He has consistently produced fantastic work in a very professional, charming and fun way. 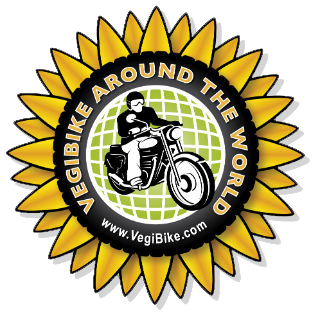 The logo will adorn the motorbike on the panniers and the top box, and I intend to get loads of stick on badges to mark my trail. hey harry, its Jane shaw here. you may not know but Greg mentioned you were in grenoble now....well we live about 1 hour from grenoble in the alps. do come and grab a civlised bed/weekend - if you are allowed especially if your bike is causing you trouble......its totally miserable weather...so I know what you are sleeping in - i have not known weather like this since living here. we are also great campers but probably more civilised than you so if you want we can tell you some great spots to go.....anyway do give us a bell if you need rescuing - 0033 476 11 01 08 or my mobile: 07931 772 387.